Fly anglers in Maryland are experiencing some great trout fishing on waters both big and small. The sulphur hatch on the Gunpowder and many of the freestone streams in the state provide great fishing in the evening. 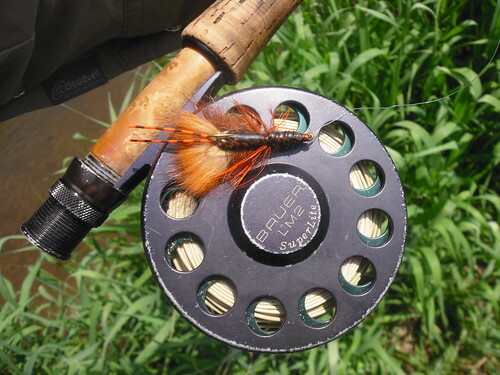 Caddis and midges are a good bet for dry fly anglers fishing in the morning or even midday on sunny blue bird days. Blue wing olives are hatching in good numbers on cloudy days, and get the fish sipping naturals in the flat water. Nymphing is producing a lot of fish, and larger browns for anglers bottom bouncing shallow riffles and deep pools. Caddis or midge pupa paired with mayfly nymph imitations are consistently producing trout, and the shop has a large selection of effective patterns. For anglers looking for the big trout, consider fishing a baitfish or crayfish pattern like the one pictured above. I fished this crayfish pattern on a freestone stream and enticed some large trout into chasing the pattern, but I only landed browns in the 10-12 inch range. On a different day I fished the Gunpowder and lost a really nice brown using a shop caddis pupa pattern. I was fishing a caddis/sulphur nymph tandem in a choppy riffle while the adult caddis hatched out of the water. I set the hook on a strong fish and tried to keep it from running me into any debris. I directed the trout into slower water and got a good look just as the fish came unbuttoned. The brown had big jaws and was between 17-18 inches, so it looks like there are some bigger fish feeding subsurface during these hatches. The latest video features a mix of water and fish from small water to the Gunpowder River. This entry was posted in fishing report, video on May 22, 2010 by Jason du Pont.